Ford prices raised by 4% | What Car? 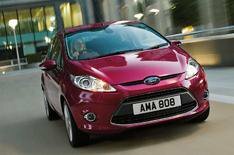 Ford has announced that it will raise its UK prices by an average of 4% from July 1. The price increase, which is the third this year, has been blamed on the weakness of sterling against the euro. Nigel Sharp, managing director Ford of Britain, said: 'In common with most of the UK auto industry, Ford is reacting to the sustained weakness of the pound against the euro. He added that even with the recent strengthening of the pound, the need to recover losses could lead to further price increases. Prices for Ford cars will rise by an average of 4%, which means an extra £600-650 on its most popular models, such as the Ka, Fiesta, Focus, C-MAX, Kuga and Mondeo; rising to £700 on a Ford S-MAX and £800 for a Ford Galaxy.